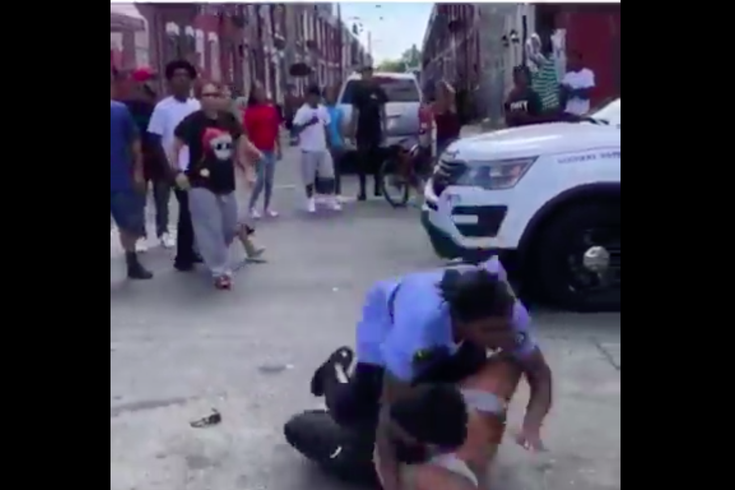 A video of a Thursday afternoon arrest on East Cambria Street in Philadelphia has gone viral. The “she” in question is a Philadelphia police officer. The “beast” summary was likely inspired by the fact that she totally decks a guy who’s swinging and struggling to the point that her uniform shirt is ripped open exposing her bulletproof vest. There’s a lot of screaming as a crowd congregates around the fracas. And yes, Philadelphia police say they’re aware of the incident. Officer Troy Brown of the department’s public affairs unit offered some limited details about what’s known at this point. The incident happened around 1:25 p.m. Thursday in the 100 block of East Cambria Street near the city’s Fairhill and West Kensington neighborhoods. According to Brown, the officers seen in the video were “conducting a pedestrian investigation, the circumstances of which are still being investigated” at the time. From there, “a 23-year-old Hispanic male became involved and a physical altercation ensued,” Brown said. He was arrested and charged with aggravated assault, simple assault and related offenses, police said. His identity was not publicly available on Friday afternoon and Randall did not immediately respond to a request seeking more context of what happened before he started filming. You can watch what happened in the embedded video below (as long as the man who posted it hasn’t taken it down yet).